First, upon the patient’s arrival, history-taking and physical examinations should be completed, and the airway should be maintained by placing the patient in a comfortable position conducive to proper breathing. Patients with difficulty breathing due to inhalation burns or burns to the upper airway should be provided with a 100% oxygen mask until the arterial blood gas level has returned to normal. If the difficulty in breathing continues, endotracheal intubation should be carefully considered. Because endotracheal intubations, which are relatively easy to perform immediately after the patient has arrived, can become quite difficult to perform after administering a considerable amount of fluid to the patient in the course of treatment, it is recommended that preparations for endotracheal intubations be kept ready and available. Second, fluid therapies should be applied to assist in maintenance of normal systemic circulation, and a blood vessel should be secured to allow for immediate treatments in case of emergency. Third, the examination for the presence of other traumas or injuries should be completed. In the case of injuries resulting from falls from a tall building due to fire, head injuries, chest injuries including pneumothorax, spinal injuries, intra-abdominal injuries including ruptured viscus and hemoperitoneum, and excessive hemorrhage due to pelvic and long bone fractures should be evaluated using x-ray and CT scans. Patients with burns may have generally low blood pressures; however, if there is extensive hypotension or systemic hypovolemia in the early phases for some other unaccountable reason, the possibility of other injuries should be investigated. When transferring the patient to a special burn center, injuries other than severe burns should be treated and the airway should be stabilized prior to transfer. Fourth, history-taking and physical examinations should be re-performed. If the burn was caused by fire in a building, witnesses and the rescuer should be questioned about the any possibilities of the patient having been in an enclosed space to eliminate or confirm the possibility of inhalation burn. 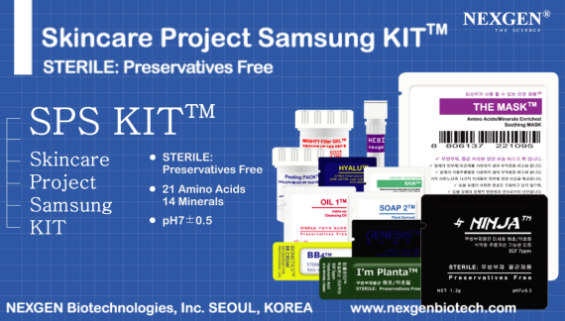 Past history of other diseases, currently used drugs, and allergic symptoms including hypersensitivity should also be investigated. Physical examinations should be performed after the patient is completely undressed in order to enable examination of injuries in all parts of the body. 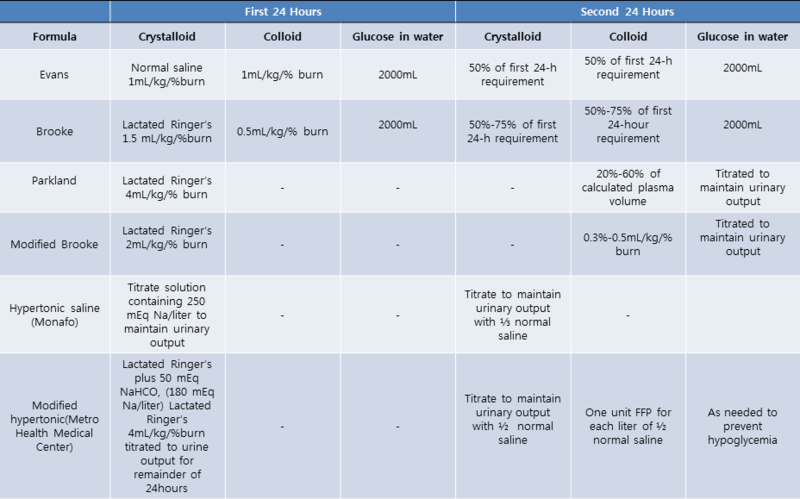 When the patient is transferred from another hospital, it is important to obtain accurate data on the amount and type of the pretreatment fluid as the basis of further fluid therapy. Indications of inhalation burns include severe burns to the face and neck, singed hair on the head and of the nostril and face, deposition of carbonaceous materials in the pharyngeal area, and carbonaceous sputum. 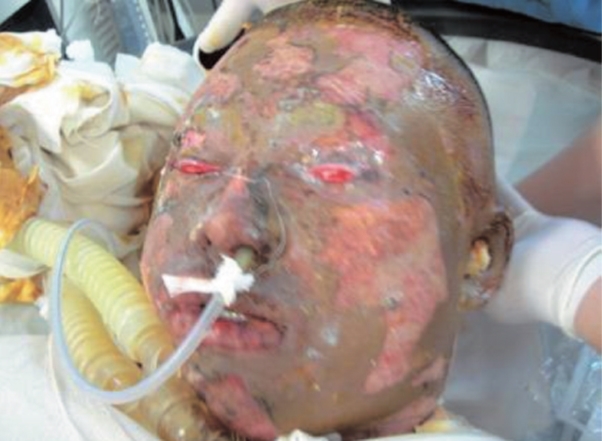 The inhalation burn is one of the main causes of death among burn patients, and increases mortality to 30-40%. In the case of suspicion of an inhalation burn, early endotracheal intubation is ideal in preventing respiratory distress. While the diagnosis may not be clinically certain, inhalation burns should be suspected if the patient has suffered burns in an enclosed space. Carboxyhemoglobin levels (COHb) of 10% or more detected by arterial blood gas analysis may also be a key factor in the diagnosis. Additionally, carbon monoxide poisoning may induce headache and nausea at levels of 10-20% COHb, dizziness and weakness at 20-30%, and coma and eventually death at levels near 50%. 100% oxygen therapy is the most essential method of treatment. 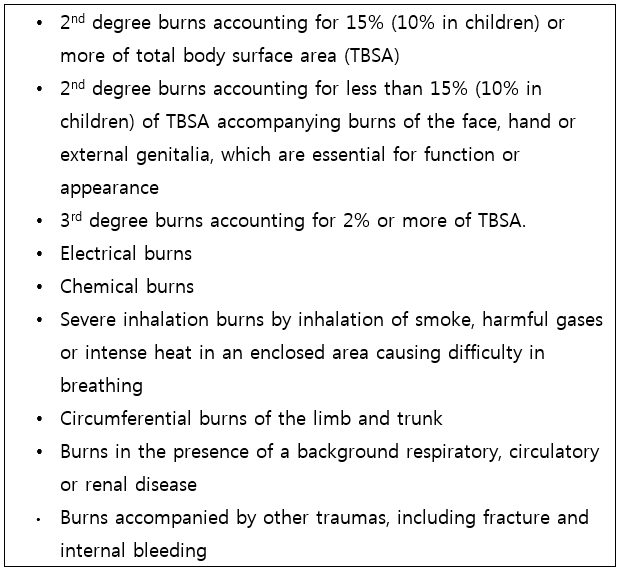 Location and environment where the patient suffered injury, cause of burns, amount of fluid administered in another hospital, and presence of wound treatment are important elements for accurate and rapid emergency care as they allow for effective assessment of any injuries or conditions that may have been missed in patients, thereby condensing time spent for examination and prevalence of severe injuries or complications. ① In the case of circumferential burns of the limb and chest, thick and inflexible circumferential eschars of the chest may cause respiratory distress. Incisions should be made starting from the middle of each of the bilateral clavicles down in a vertical line to the subcostal margin (see following figure). If the burn is moderate, the resultant eschar can be relieved by performing escharotomies along the bilateral anterior axillary lines. Circumferential eschars of the limbs, and especially of the hands may increase distal blood pressure and block the bloodstream, causing distal limb necrosis or compartment syndrome. The escharotomy should be made for the full depth of and along the full length of the eschar so that the subcutaneous tissues are sufficiently exposed. 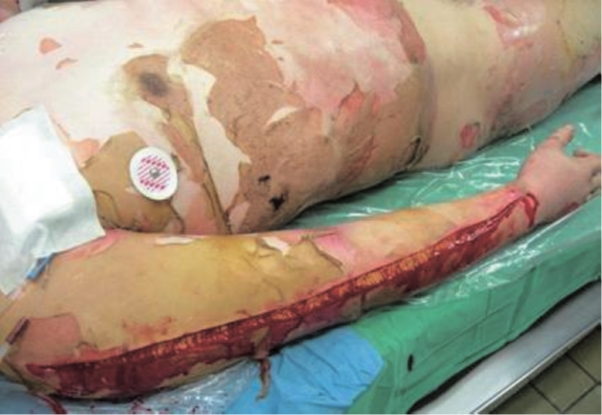 Fasciotomy should be performed for the fascial compartments of the limb. d. loss of a palpable pulse, absence of Doppler pulses, compartment pressure ≥30mmHg. After escharotomy, presence of blood circulation in the distal areas should be confirmed. If blood circulation is not improved after escharotomy, further assessment for other causes of inefficient circulation such as insufficient fluid therapy should be completed. The cause of burn shock is complex in most cases. In the early phases of burn injury, capillary permeability increases, inducing hypotension, and a maximal edema can develop in 12-24 hours. Vectors, such as Vasoactiveamines, prostaglandins and leukotrienes, are known to increase capillary permeability. Furthermore, burned tissues affect surrounding unburned tissues as well by increasing sodium concentration in the cells and inducing cellular edema. An IV line should be secured and sufficient fluid replacement should be performed according to the proper formula and the patient’s clinical symptoms. 4) To monitor fluid resuscitation, a catheter should be inserted and urine output per hour should be measured. The monitored urine output should be maintained at 0.5~1ml/kg/hr for adults, 1~1.5ml/kg/hr for children, and 1.5ml/kg/hr for infants. Proper fluid resuscitation should be based on the amount of fluid infused per hour, and rapid bolus infusions should be attempted only in cases with severe hypotension or little urine output as it may cause disruptions in continuous and accurate fluid therapy. Burns covering 20% or more of the TBSA require a nasogastric tube insertion to prevent ileus and vomiting.